Ritchie Djamhur is a macchiato-addicted IT Buyer based in Sydney, Australia and also posts his thoughts on technology, music and anything else that keeps him up at night onwww.ritchiesroom.com. The Android Honeycomb market has been heating up in earnest in recent months, with major PC manufacturers releasing their own tablet offerings. Acer, Asus, Toshiba, and others have entered the market and all three bring different elements to set themselves apart. And let’s face it, in a world where Google has yet to release Honeycomb as open-source, it’s possible that we’d be staring at the same Tegra 2 based 10 inch touchscreens with slightly different bodies. But instead each supplier, and Asus in particular, have gone to great lengths to come up with devices that don’t just fit the tablet mould â€“ in fact, they’re just a bit to bulgy for that. Asus’ Transformer model has been noted for its overall quality, design and its uniqueness, particularly with its detachable keyboard. Asus have taken this concept one step further and asks the question â€“ if the keyboard component worked so well on the Transformer, would an integrated keyboard in a tablet be just as successful? The answer is a resounding yes, though with some caveats, mostly related to bulkiness and weight. But if you’re willing to put up with a thicker, heavier unit, and expect to do a fair bit of emails, documents and any other types of data entry that needs a keyboard, this unit could be your answer. In fact, one could argue it is practical and impractical all in the same breath. It really depends on your usage. Asus very kindly provided a pre-production sample for this review, so some of the software and associated performance may not be the final build. Find full specifications for the Asus Eee Pad Slider here. The first noticeable aspect is the dimensions â€“ slightly shorter than an iPad 2, a fair bit longer, but way, way thicker â€“ 17.3mm vs 8.8mm. That thickness does make the unit more cumbersome to hold. But here’s the killer stat â€“ it’s a bulky 960g vs a svelte 601g for the Apple incumbent. This doesn’t make the Slider a promising companion for long movies or extended stretches of ebook reading. You certainly don’t notice the weight when using it casually, but once you get past the 10-15 minute mark, it lets you know that it’s there. From an input/output scenario, it has all the necessary goodies: full size USB, micro HDMI, and a micro SD card slot. It also has volume control buttons, a headphone jack, and a proprietary port for connecting to a computer. The front-facing webcam is 1.2MP, while the main camera on the back is 5MP. Interestingly when in tablet mode, the front grill appears to be where the sound is pumped through, and in its closed state that’s probably true. However, there are some significant sound quality increases when the keyboard is slid out and the tablet is in keyboard mode, and I’ve identified some subtle grills to each side of the bracket that are actually the true speakers. It makes for a very enjoyable experience watching an episode or movie while on the desk or kitchen bench. The IPS screen that adorns the Slider is the very same that has been slavishly admired by many reviewers of the Transformer. It continues to set benchmarks for its ability to be viewed in most lit environments, and reproduces colours very accurately. The 1280 x 800 resolution is the same as its 10 inch Android competitors but the IPS certainly sets it apart for pure picture quality and viewing in sunlit locations â€“ places you’d expect to actually be using a tablet. Side viewing angles are virtually 180 degrees, so it’s definitely a tablet you can use in a group situation to share pics, hold an impromptu presentation, etc. The capacitive screen is very responsive, and that’s a compliment to their integration of Gorilla Glass from Corning Ware, which could well have protected but also dulled the screen in terms of picture quality and interaction. Thankfully, neither of these is negatively affected. Looks like a worthy successor to the MBA! 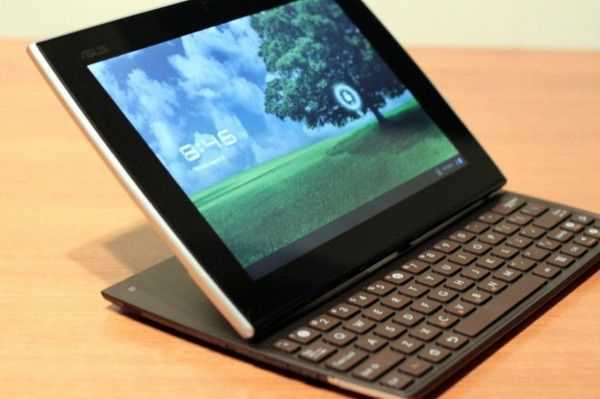 If it has a keyboard, then it’s not a tablet, it’s a netbook. That may be your personal definition, but I wouldn’t say it’s one shared by the majority. Sorry, but disagree. The form is of a netbook and not a tablet. Sure doesn’t look like an i-Pad or Galaxy S form to me. At one time, ‘everyone’ thought the earth was flat and the sun rotated around the earth. So, being in the majority isn/t proof of anything. True, but the netbook form-factor is a human-made thing and thus it is defined by humans; this is not so for laws of physics. It is only recently that the majority of tablets are manufacturered without a keyboard. Tablets with keyboards existed long before the term “Netbook” was coined. Netbooks don’t have touch screens. Sure they do. How about Lenovo IdeaPad S10-3t? Glad to see there’s a Slider with a proper keyboard layout. The one I got to test in the last weeks came with that awful European layout, with the bigger enter and the tiny Left Shift. The same Asus uses for all laptops in my country and a total fail in my eyes. I also hate that there’s no trackpoint, I see you guys weren’t too bothered by this aspect, but i found it a bit frustrating to have to reach for the screen all of the time. And carrying a mouse around ain’t really a solution for a device that should be ultra-portable. Also, I don’t think the sound is redirected towards that front grill. The speakers are definitely there on the back near the sliding mechanism and their volume is quite low for my ears, especially when using the Slider in tablet mode. I carefully checked to see if the sound comes from the grill and i’m pretty sure that’s there just part of the design. Sound comes from underneath the screen, and that’s why it’s a bit stuffy in this mode. I’m all for trackpointers myself. While you compare it for weight and dimension to the ipad – it loses, but why don’t you continue comparing it to the ipad with all the input/output scenarios? the keyboard itself? then the ipad outright loses completely and can’t do without accessories – try carrying them around all the time. Why don’t you compare it to other Android tablets? i always wonder why everything has to be compared to that companies products? 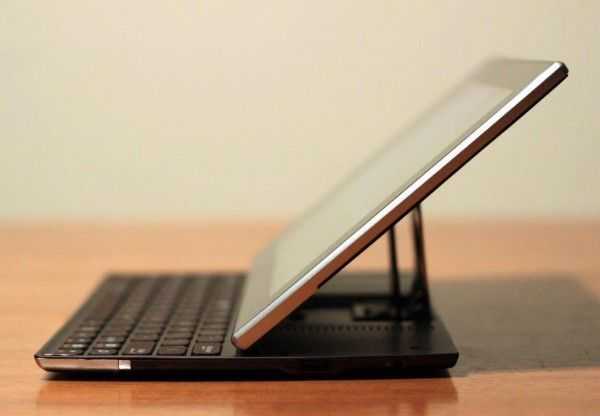 If people consider an Android tablet with keyboard, then they go for Asus with Android – who cares about ipads. Just because ipads are the most sold devices it does not make them the best out there. I think the weight of the Slider should be compared to the weight of a non-slider tablet plus a case. A 10 inch tablet really is much more useful if it can stand by itself at an angle appropriate for reading. It’s a pain, literally, to hold a tablet of this size for more than a few minutes. For most tablets, the answer is a case that can hold the screen at an angle. The slider sits at a decent angle for reading, so it doesn’t need a case. The official Apple Smart Cover for iPad 2 weighs 137 grams (4.8 oz). Typical 3rd party covers weigh a few grams more.